Alex Winder received his PhD in May 2017 from the joint program in History and Middle Eastern and Islamic Studies at New York University. His research focuses on policing and crime in British Mandate Palestine, with attention to the tensions and accommodations between legal and social order and the role of Arab policemen and Arab communities in negotiating these domains. He edited and introduced Between Jaffa and Mount Hebron: The Diary of Muhammad ‘Abd al-Hadi al-Shrouf (published in Arabic by the Institute for Palestine Studies, 2016) and has published in Arab Studies Journal, Auto|Biography Studies, Biography, Jerusalem Quarterly, and the Journal of Palestine Studies. 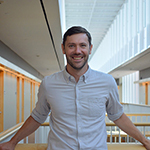 Before transitioning into his current role as academic adviser to the concentration, Alex Winder was the 2017–2018 Postdoctoral Research Associate in Palestine and Palestinian Studies at Brown University and associate editor of Jerusalem Quarterly.